Having already taken us through a young boy’s imagination in “The Yellow Boat,” a journey of self-discovery in “Pippin,” and the true tale of the fate of Mary the elephant in “Elephant’s Graveyard,” California School of the Arts-San Gabriel Valley (CSArts-SGV) chose to take its audience back to the turn of the 19th century for its fourth production of the year. With a cast of students from grades nine through 11, CSArts’ production of Oscar Wilde’s “The Importance of Being Earnest” takes audience members on a journey of endless surprises and laughter. Following the comedic misadventures of Algernon, Jack, Cecily, and Gwendolen, “The Importance of Being Earnest” tells a story of why it was supposedly important to Algernon and Jack not only to be earnest, but also to literally be Ernest. Despite their entanglements with the idea of earnestness and Ernest, all the characters were uniquely un-earnest in their own ways. Each of the characters were charming and unique; Jack Worthing (Jacob McNulty) is seen as a respectable Victorian gentleman although he also leads a double-life as “Ernest,” while Algernon Moncreiff (Brayden Maniago) is idle, constantly eating, and ignoring his social obligations by visiting his fictional invalid friend. While Gwendolen Fairfax (Katia Choi) is the epitome of Victorian womanhood, Cecily Cardew (Aria Tomar) is an antithesis to those Victorian conventions. Through the lighthearted satirical dramedy and their unique characters, students were able to explore and shed light on various societal conventions. “From the dual-life scrapes of the play’s privileged young gentlemen to the paternalism faced by the forward-thinking young ladies who are eager to bend the rules of engagement in their favor, every character on our stage represents a unique cultural heritage, interwoven into the fabric of a turn-of-the-century British society that was struggling to keep up with fast-changing times,” said the play’s director, Jer Adrianne Lelliott. Despite the setting and the time frame of the play, the comedy of the piece was easy to understand, and the actors’ performances brought out the relatable qualities of each character. From the way Algernon declared that eating is the only thing that consoles him while stuffing his face with muffins, to the way Gwendolen told Cecily that she always carries her diary because a lady should always have something “sensational” to read on the train, all of us could find a little bit of reality and relate to the outrageous situations. Even the supporting roles added a new layer of humor through their actions seen only by the audience. “The process of the show was very frustrating as we had to learn dialect… but it was probably the most fun I have ever had because we had to learn to live in the 1890s. This show was super unique as the director gave a different spin of the play as it gives a subliminal message for women, and the women in this play are very strong figures that no other play really gives,” actor Brayden Maniago said. 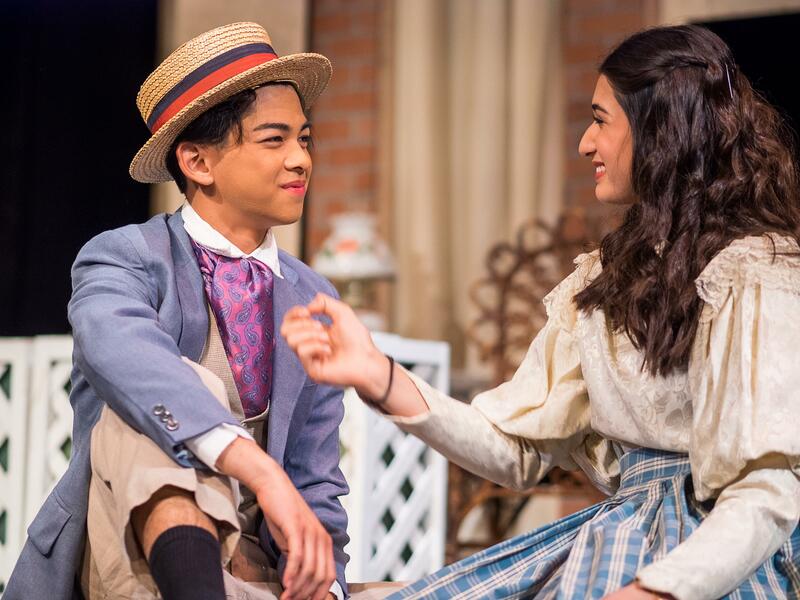 Opening with a full house, CSArts’ production of the classic, “The Importance of Being Earnest” taught us not so much the importance of being earnest, but rather reminded us of the importance of finding humor and wit in the midst of messy situations. “The cast and crew have grown to become my second family. We helped each other improve and [embraced] everyone and all of our little quirks… The most rewarding thing about doing this show is always when we get a laugh from the audience and it gets hard for us to keep a straight face. Whenever we are performing and we get laughs, we all smile internally,” actor Aria Tomar reflected. There were definitely plenty of laughs to go around that night. The remaining shows for “The Importance of Being Earnest” take place March 30 and 31 at 7:30 p.m., and March 31 at 2 p.m. at the Sierra Madre Playhouse, 87 W. Sierra Madre Blvd., Sierra Madre, Calif. 91024. Tickets are available online at http://www.sgv.csarts.net/boxoffice.